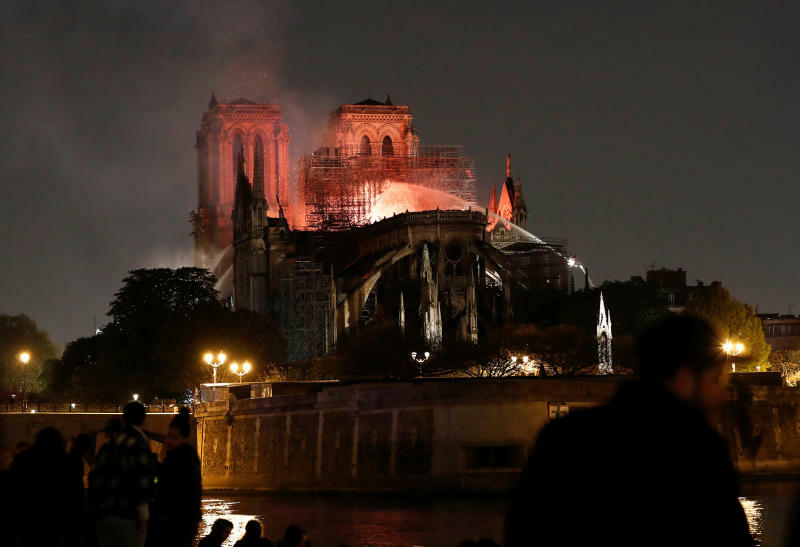 French President Emmanuel Macron told reporters near the scene that he will seek international help, including the "greatest talents'' in the world, to rebuild Notre Dame. US President Donald Trump, speaking at the start of an appearance in Minnesota, spoke of the "terrible, terrible fire'' that devastated "one of the great treasures of the world." The Notre-Dame Cathedral, situated on an island in the Seine River in the heart of Paris, is one of the world's most visited tourist destinations, drawing some 13 million people each year. The fire's emotional impact was widely felt. People from all over described in Facebook posts how they cried when they heard about the fire. Former US president Barack Obama posted an old photo of himself, his wife and their two daughters lighting candles in the cathedral. Cardinal Timothy Dolan, the archbishop of New York, prayed at St Patrick's Cathedral in Manhattan for intercession. "God preserve this splendid house of prayer, and protect those battling the blaze,'' Dolan said in a statement. UN Secretary-General Antonio Guterres tweeted that he's "horrified", calling the cathedral "a unique example of world heritage."